Here in the Midwest, temperatures are starting to dip, and we’re starting to pull out sweaters, swap our iced brew for Pumpkin Spice Lattes, and reaching for more cold weather comfort foods. 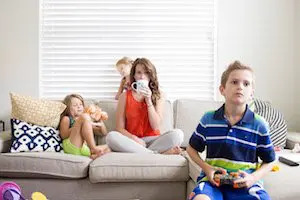 Lately I’ve really been craving a hot, savory breakfast in the mornings, but it’s just not realistic to cook a proper breakfast while wrangling three kids for school. 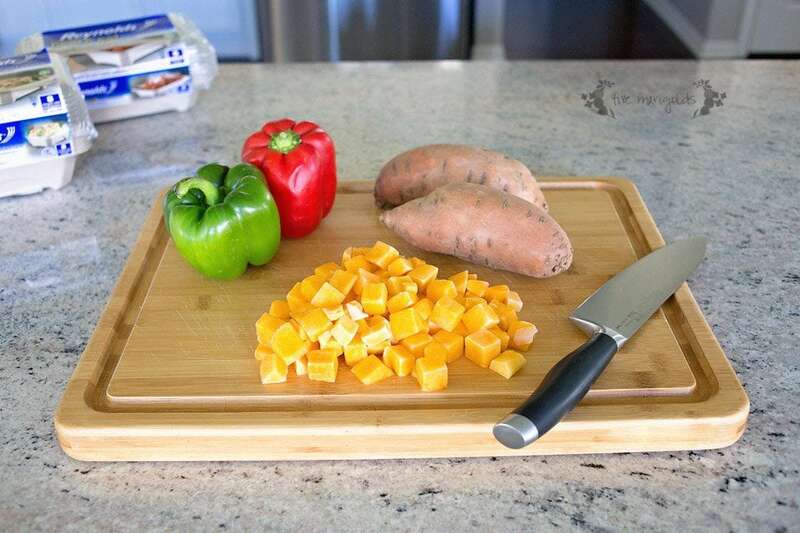 This week I decided to solve that problem by prepping one of my favorite breakfast recipes for the week: Sweet Potato and Butternut Squash Hash. This recipe is perfect for the season, with fall flavors like butternut squash and sweet potatoes. To make this recipe, place squash and potatoes in a bowl and toss with garlic powder, salt and pepper. Pour the olive oil in the skillet on medium-high heat and add the squash and potatoes. Saute just a couple of minutes, until you start to hear it sizzle, then reduce it to medium-low and cover for 20-25 minutes, shaking the pan occasionally to avoid burning. Meanwhile, set out your meal prep containers. When the potato and squash mixture is done cooking, but still firm, remove it from the pan and divide it evenly among your containers. The goal is that the mixture is slightly undercooked, since it will be reheated for breakfast. Next, add sausage to the skillet and cook on medium-low until seared on both sides, about 7 minutes. Add peppers, onions, rosemary, salt and pepper and saute just a few minutes. Divide this mixture evenly into the containers. You can also add a scrambled egg to this recipe. My husband prefers it with the eggs, and I prefer it without. Just cook your eggs as you would normally, being extra careful not to overcook. Top with a little cheese. So. Good. Looking for more meal prep ideas? You’ll find tons of delicious inspiration here. 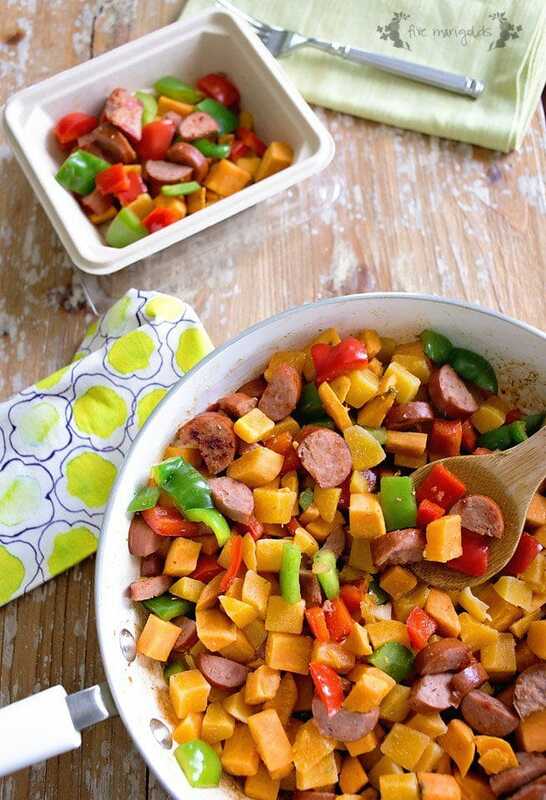 This delicious and colorful hash is perfect cold weather comfort food, with fall flavors like butternut squash and sweet potatoes. Place the squash and potatoes in a bowl and toss with the garlic powder, salt and pepper. Pour the olive oil in the skillet on medium-high heat. Add the squash and potatoes. Sautee just a couple of minutes, until you start to hear it sizzle, then reduce it to medium-low and cover for 15 minutes, shaking the pan occasionally to avoid burning. Remove potato and squash mixture from the pan and set aside. Next, add sausage to the skillet and cook on medium-high until seared on both sides, about 7-10 minutes. Add peppers, onions, rosemary, salt and pepper and saute just a few minutes, until onion are translucent. Combine the potato and squash mixture, sausage, and onion mixture and heat on low for 5 minutes. Optional: Top with eggs, scrambled or over easy, and cheese. Man this looks yummy. I am so bad about eating breakfast and really need to start doing better. 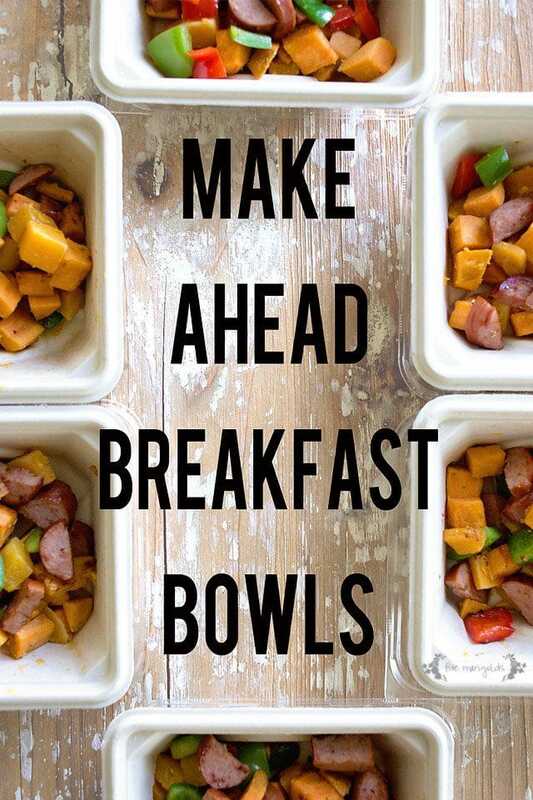 This is a good idea to make it easy in the mornings. Thanks for sharing! It does make it so much easier to get a good breakfast in! Such a great idea and we love heat and eat containers at home! Thank you Lauren! Leftovers are a great thing, when done right! Yum! I have a few butternut squash and bell peppers sitting in my kitchen, and this sounds so good. 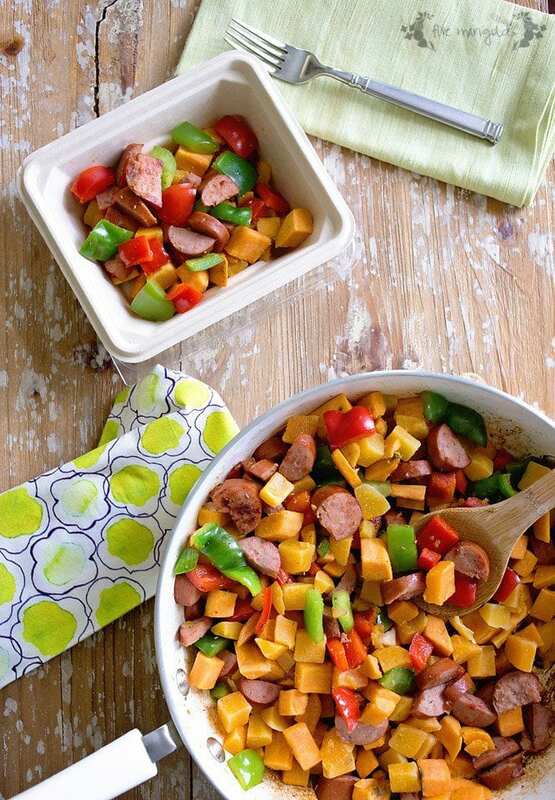 Adding kielbasa to my grocery list and pinning this recipe to make soon. I love that this recipe can be adjusted for whatever you have on hand. Let me know how you enjoy it!